Home Business SEBI’s ignorance of happenings at MCX – Déjà vu? Is Ajay Shah going to crack the data pipeline from MCX like it was done at NSE? Is SEBI probing it? Is the Securities and Exchange Board of India (SEBI) committing the same mistake in dealing with Multi Commodities Exchange (MCX), India’s top commodity bourse that it did by showing a lax attitude in investigating the National Stock Exchange (NSE) when a whistle-blower first blew the lid of the co-location scam in January 2015? 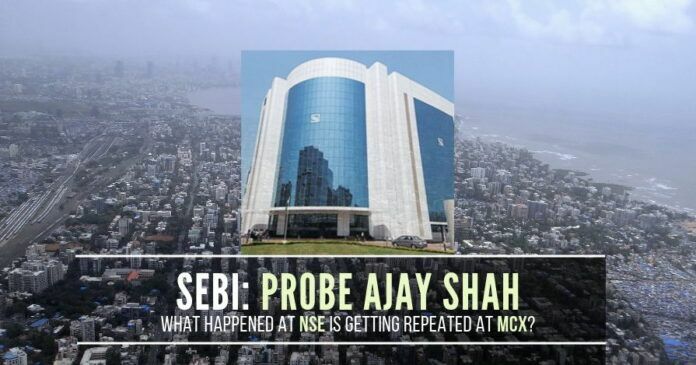 At the heart of both NSE and MCX is the role of Ajay Shah, the consultant to the Finance Ministry during the Congress-led UPA regime but the capital market regulator’s careless approach to the happenings at both the exchanges have provided a perfect cover to Shah and the PC-led cabal operating with immunity in India’s financial markets. If NSE was sharing data with Shah, which in Shah’s own words “could be a problem if revealed,” it has come to light that MCX too shared trading data with those closely linked to Shah in late-2016. Is this not reason enough for a deep and full-blown investigation into the matter? There exists an email exchange between two of the top MCX executives saying that ‘end of day data pipeline’ was being rolled out to Indira Gandhi Institute of Developmental Research (IGIDR), which is run mainly by Shah’s wife Susan Thomas. In the last post NSE-MCX merger – The setup, PGurus detailed how SEBI’s order in co-location scam mainly involving NSE and key officials is much awaited to revive the talks of a merger deal and how subtle board level changes were in process to make good the deal, here we reveal SEBI’s kid-glove approach in dealing with the shenanigans at MCX. “But you have to swear everyone to silence on the fact that the data that we are getting out of NSE for VIX (volatility index) and LIX (liquidity risk index) is being used for algorithmic trading work — it would be a severe problem if this fact comes to light since NSE has not given anyone else this data,” Ajay Shah, wrote in a 2009 email. The above-mentioned email is part of a SEBI report that indicts Shah for his role in the co-location and algo trading scam that rocked the NSE between 2010 and 2015. Shah’s sister-in-law, Sunita Thomas, is a founder-director of Infotech Financial and Chanakya Tradevistas that provided algo trading solutions and software to brokers. Sunita Thomas is married to Suprabhat Lala, who was chief of regulation and head of trading division at the NSE during 2010-13. These connections of Shah were well in the pubic domain in 2015 when first two whistle blower letters detailing NSE’s co-location scam surfaced and SEBI had even ordered an investigation into the scam. Yet, MCX, a supposedly first level regulator as an exchange, decided to share ‘data pipeline’ with IGIDR and its executives are now fending ignorance that they were not aware about Shah’s role at NSE co-location scam. Also, the so-called ‘alert watchdog’ has conveniently turned a blind eye and gone easy on dubious happenings at MCX. A key reason for this is the stoic silence of top SEBI officials handling MCX as part of their portfolio. These are the same SEBI officials who worked under former FMC chairman Ramesh Abhishek and moved to SEBI after merger of the commodity regulator with SEBI. Readers of PGurus are by now well aware of how Abhishek was instrumental in invigorating and propping up the NSEL crises rather than showing interesting in solving it, which lead to change in ownership of MCX. Is it not worth investigating as to on whose order was MCX sharing ‘data pipeline’ with IGIDR? A clinching evidence of this is an email from V Shunmugam, head research, MCX. The email sent to MCX MD and CEO Mrugank Paranjape is copied to MCX former chairman P K Singhal (on CC). Is it not worth knowing what Paranjape and Singhal have to say about sharing of data with IGIDR? A look at NSE’s co-location scam and Shah’s statement to SEBI in the matter will show that data pipeline is just like giving a pass key or login of servers to parties and thereby allow them to download full end of day data. This is crucial as it may not leave audit trail like sharing of data via hard disk, where one can know what was shared. How do you ensure client position confidentiality in such means of sharing data? Shah told SEBI that apart from CD-ROMs and USB hard disks, they had an arrangement with the NSE to give them an IP address and password for downloading files directly (pipeline). When seen in this context does it not put MCX in the dock too for its method of sharing data? Where is SEBI’s show cause notice or its own investigation into the matter? IGIDR was given access to MCX daily data at the end of 2016 on the pretext of a study on commodity transaction tax, which was implemented in 2012. Does this not arouse suspicion enough? A customary audit was ordered by MCX when certain newspaper reports highlighted the matter after another whistle-blower letter started doing the rounds on ‘data pipeline’ but it is key MCX executives have not allowed full access to the forensic auditors of their emails, which includes Shunmugam. Does this not ring any bell with SEBI, which initially displayed a lax attitude even in NSE co-location matter by not ordering any full-scale investigations in the early months giving time to high profile accused to wipe-out traces of evidence? A look at rise in salary of Shunmugam and a colossal rise in sitting fees paid to board members and frequency of meetings held will throw up other interesting angles. Allegations of trust run by certain board members of MCX getting money too have been flagged to SEBI by the whistle-blower. It is now learnt that certain top MCX officials who have quit the exchange as the controversy raged are eying role as DMD with NSE, which is not a key management person appointment and hence does not require SEBI approval. It remains to be seen if NSE wants to oblige. Media reports of a scheme to remove Satyajeet Bolar, MCX vice-president, finance and accounts by shifting him to a subsidiary and calling his post redundant there (CFO in a clearing corporation is a Key Management Personnel (KMP) and requires SEBI intervention for appointment or removal), whistle-blower allegations of mismanagement including on exchange’s technology committee for contracts worth around Rs.20 crores to London based company PSEB for developing software for spot exchange (software was to be delivered by Dec 2018 and advance payment of about Rs.14 crores was made to vendor but the delivery of software is nowhere even in next 8 months), award of project office contracts to Capgemini and money paid by the exchange to trusts linked to a board member are all being brushed under the carpet while SEBI observes as a bystander. Does SEBI not want to question the MCX technology committee? Who headed this committee? Sources say, SEBI was seeking details of board minutes after reports of NSE-MCX merger first surfaced in media in 2018. The MCX share price saw huge volatility and there were allegations of insider trading and front running too as neither MCX nor NSE issued any denial to the reports. While the circus at MCX continued, the operating income and trading volumes at the exchange have gone to the dogs in past three years and a deep study of the exchange balance-sheet and that of its 100% subsidiary MCX Clearing Corporation could reveal way higher spends. Surprisingly, shareholder directors on the board of MCX have even been made directors on the board of MCX subsidiary too. Why this undue favour? In the last post, PGurus wrote about MCX board members’ business dealings with NSE, it has now come to light that SEBI is already investigating money paid to the same board member by MCX for a directory related business. Conflict of interests galore. But will there be any action? Who in SEBI is responsible for looking at MCX as a portfolio? Next articleRahul Gandhi’s NYAY scheme comes at the expense of the Middle Class? Inaction on the part of Mr.Jetly raises many questions. Even in the case of NSEL we are shocked and worried to note that so far not a single action is being taken by the FM to punish culprits even though investigations by all agencies have very clearly proved who are main culprits. I believe SEBI regulatory agency comes under the Finance jurisdiction- Jaitley is current Finance minister- he is culpable- to any corruption under his jurisdiction- why has MODI remained silent- Jaitley is quick to vocalize against the opposition and related corruption perpetrated by morons in that group. where is CBI? Where is the finance ministry?- Jaitley has to be unceremoniously kicked out – replaced with Swamy. I think it will happen when Modi is returned for the 2nd term. Swamy will be the next finance minister- and clean up will begin – in all agencies under the finance ministry’s jurisdiction. PGurus has written several posts on the regulatory corruption and inaction- leading to whether the indian bourses is fair and reliable and clean. if and when that doubt matters to overseas investors- you will see erosion in those indian exchanges- which can impact on GDP , monetary valuations and growth of indian companies and financial institutions. I fear that SEBI and the finance ministry is playing a dangerous game- downplay the fraud to trading in the indian exchanges- undo the fraud quietly- assign no blame- trading continue with no disruption- the indian economy moves forward on the expected trajectory, and no impact on foreign exchanges and monetary units. when Swamy becomes the finance minister- he would bring this fraud up with MODI- best he can do it remove all the corrupt players. he may not be able retrospectively reverse trades in the exchages- the fraud is broad, widespread, crosses borders, complicated to undo, potential to create a quake among several major exchanges. I am making a judgement on the behavior of the indian regulatory agencies and the finance ministry and the Modi government. Look- Pyush Goel- interim finance minister- a chartered account- must know of this predicament- and right before the 2019 elections- it is very tricky- when trying to win a 2nd term in office. Swamy- when he assumes his office- and I hope MODI has the guts- he may have to swallow some of fraudulent acts allowed to perpetrate by the previous finance minister in the UPA regime- for the certainty of economic activity- in India and ariund the world. unfounded on my judgement. but this is gut feel. interestingly- It would be a Swamy that can bring a resolution to this fraudulent debacle. I hope MODI has the guts to clean up finance ministry and related agencies- amongst others- reminder Balacott- he has that in him- for INDIA to become a financial superpower- enabling becoming a super military power- it has to go together.